One of the most predictive factors in the midterm GOP wave elections of 2014 that gave the GOP power in congress [the House and the Senate] and at the state legislatures all across the nation, was the president's low approval rating as shown in the Real Clear Politics poll of polls. The low presidential approval number was the reason the Tales predicted the GOP wave pick ups in the Senate, House and Gubernatorial races closer than even the greats, Nate Silver, Real Clear Politics, and the Hedgehog Report. The Tales realized the importance of the President's low approval to the actual outcome of the midterm races, even more than the polling of the races themselves. Yes, it is true the president isn't running anymore, and there are no more midterm elections to worry about, but I believe that once again, the president's approval numbers will be a huge indicator which party will win the White House in the November 2016 elections. If the president's approval rating is near or over 50% during the year 2016, it will be very difficult of the GOP to win the presidency. However, if the president's approval is well below 50%, especially in the lower 40% range, than there is no way the nation will turn to the Democrat candidate and give what will be a virtual 3rd Obama term by electing the Democrat if the GOP puts up a viable candidate at all [which I am certain they will with the extraordinary heavyweight field of candidates they have]. So, that is why I got very concerned about the president's rise in approval numbers since the beginning of the year 2015. The president was having a dramatic rise in his approval from all of 2014, when the president never reached even 45% one time during the whole year in the Real Clear Politics average. Check out the following chart from Real Clear Politics of the president's approval vs disapproval numbers for the year 2014. In the year 2015, I am theorizing, that because of the new year [which usually brings renewed optimism at the start of the year], and the president's State of the Union address, and most importantly the lowering of gas prices, President Obama's approval numbers rose and his disapproval numbered fell. On Jan. 21, 2015, for the first time in well over a year Obama's approval reached 45%. From Jan. 21 - June 1, 2015, except for a couple of weeks between Feb. 26-March12, the presidents approval for the most part has been above 45% that whole time. On Feb. 1, 2015 the president's approval reached 46.2% in the Real Clear Politics average with a spread of only - 2.9%. That was close to even in the approval vs. disapproval numbers and it looked for a while like the president was on his way back to the 50% mark in approval. [in fact Obama's approval reached 50% in both Rasmussen-which is not surprising, and in Gallup-which is surprising]. If the president's approval had reached 50% and above in the Real Clear Politics average, that would have been very bad for those of us who want a change at the executive level in 2016 from Democrat to Republican. Because just as it was very hard to recover from low approval numbers [as was shown the whole year of 2014], I think the opposite is true that if the president had reached 50% and above, it would have been very hard to go below the numbers for a long time [probably into 2016]. But a funny thing happened on the way to Obama's approval back into positive territory. Finally, on June 2, 2015 until today the president's approval numbers are coming back to earth and president Obama is once again below, and has stayed below, the 45% mark in Real Clear Politics. At the same time the spread between approval vs disapproval is rising. If that continues into the year 2016 will be very good news indeed for any GOP presidential hopeful's chances to win. 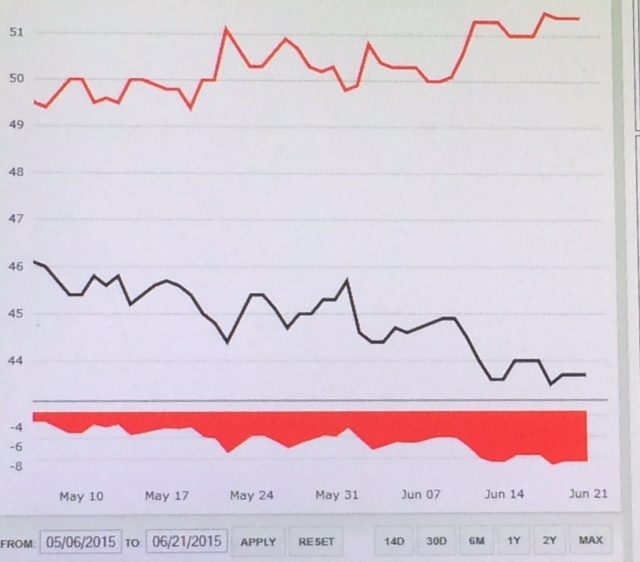 Check out this amazing graph of the Real Clear Politics presidential approval numbers from May 6, 2015 when his approval was at 46.1% mark and his negative spread was only 3.4%, until today, June 21, 2015 to see the percipitis drop back down to reality [in the low 40% range where the president's approval was the entire year of 2014. I predict that this trend of the president's approval numbers in the low 40% range [below 45%] will continue into next year when the presidential campaigns heat up. If it does, Tales can make this confident prediction now. Not only will Hillary Clinton not win the presidency, the GOP candidate [almost assuredly either Scott Walker, Marco Rubio or Jeb Bush] will win in a landslide. The American people, with these Obama low job approval numbers, are in effect saying they do not approve of a 3rd Obama term with Hillary Clinton.